I have a cinema-shame confession, I had never watched the comedy horror-spoof Attack of the Killer Tomatoes (1978) until this release from the MVD Rewind Collection, and not because I wasn't aware of it, I'd seen trailers for years, it was always on the shelf at the VHS rental shop as a kid, but the damned thing looked too stupid for my tastes - even in my youth, but as I've grown older I've softened to the big dumbness of b-movie cinema and enjoy quite a few bad movies according to my wife and kids, so it was about time to finally get my tomato on! The film opens with a scroll saying that when Alfred Hitchcock's The Birds (1963) was released people laughed at the idea of birds attacking people... until it actually happened. It's a fun bit of trivia that while I am unsure if it's true or not, it does nicely set-up the opening scene of a big red tomato strangely emerging from a drain/garbage disposal and attacking a woman in her kitchen, in the aftermath her corpse is covered in... wait for it... tomato juice! As this new red menace increases more attacks occur, the fleshy red fruit (not a veggie folks) continues to rack up a body count, the president assigns a team of "specialist" to tackle the issue, and it turns out the red menace spawned from a program designed to increase the size of tomatoes, those damn GMOs! Our fumbling heroes are a super team of supremely bizarre characters including a scuba diver, an Olympic swimmer (which seems redundant when you have a scuba diver, no? ), a master of disguise, and a parachutist who is always dragging around his deployed parachute, whom are all lead by a man named Mason Dixon. The whole affair is a camp-drenched series of vignettes and musical numbers played broadly for laughs with a certain cheap, zany-appeal, a never ending barrage of non-sequitur humor along the lines of Airplane (1978) and The Naked Gun: From the Files of Police Squad! (1988) but minus the cleverness and true wit, this stuff really is stupid for the sake of stupidity, it's even more hokey than the 50's creature features it's sending up. There are some silly parodies I enjoyed, namely the water attack parodying Jaws (1977), but it's all so flimsy and lo-fi, with a meager budget that doesn't allow for any real carnage onscreen, though there is a real-life helicopter crash that happened on film that adds some WTF-ery to the proceedings. I was flabbergasted by what could have happened to the actors in the scene, just imagining a shard of broken rotor blade slicing the actor playing a cop in half, but thankfully everyone walked away with all their lives and limbs intact. The tomatoes themselves have no teeth, they just sort of murmur while rolling along, I mean attacking! Attack of the Killer Tomatoes is a film for die-hard bad movie buffs, while I certainly enjoy some bad movies, this is pretty much what I've always assumed it was, a really dumb, bad movie that plays along like a series of loosely connected vignettes about the incompetence of government, law enforcement and the military in the face of an overly ridiculous threat. I can see how there could have been a deeper communist reading of this but the movie is too silly to land it properly. I will say that I loved how the humans won the day by playing the annoying song "Puberty Love" to drive the tomatoes out, I have to believe that Tim Burton was at least inspired in part by this movie for the final blow of Mars Attacks! (1996) when the humans cranked up Slim Whitman's piercing "Indian Love Call" to drive the Martians out of their skulls, and if this film at least inspired that movie to a degree then I guess it was all worth it after all. 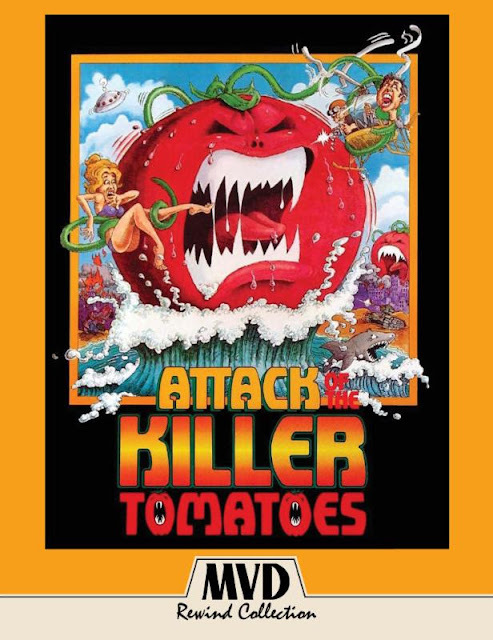 Audio/Video: Attack of the Killer Tomatoes (1979) ripens on 2-disc Blu-ray/DVD from the MVD Rewind Collection with a new 4K scan framed in 1.85:1 widescreen. The source looks very good with minimal damage to the frame aside from some white speckling and scratches, and what looks to be some sort of staining in a few scenes. I was pleasantly surprised by how nice the image looked, all the clips I've seen before seem to have been sourced from VHS, so this was a major improvement, with some modest depth, the lime green and burnt brown 70's fashions and décor look great in HD. The lone audio option on the disc is a DTS-HD MA Mono 2.0 presentation, it's limited in it's fidelity with the pre-recorded musical numbers and dubbed dialogue for a certain Asian character, so it's not the most natural sounding release, it definitely has some muffled dialogue issues, but that goes back to the source, not the new presentation. There are no subtitle options on this release, and this is one of those rare instances when I wish they would have included them because I found myself thumbing the subtitle button hoping to glean some muffled talk from time to time. Onto the extras it looks like MVD have carried-over most of what appeared on the 25th anniversary DVD version, there's a commentary writer/director John DeBello, writer/co-star Steve Peace and "creator" Costa Dillon, several vintage featurettes, two super-8mm prequels to the film, a series of sing-alongs featuring the musical numbers, trailer, radio spots, deleted scenes and a fold-out poster. This 2-disc DVD/Blu-ray release comes housed in a clear Blu-ray keepcase with a sleeve of one-sided work featuring the iconic illustrated artwork with a striking vueve orange border and spine, it really catches the eye the same illustration is featured on the slipcover (O-card). This release, as did the MVD's Rewind Collection's first release, D.O.A. : A Right of Passage, comes with a dual-sided fold-out poster of the original artwork, but does not include a booklet as the inaugural release did. The discs themselves are presented with the same white background and simple black lettering of the logo with no images on either disc. I do believe the slipcover is limited and only accompanies the first pressing of the release, it has the "Video Store Style" patina, giving it an proper shelf-worn look, the artwork on the keepcase wrap does not have the artificially worn look about it, and the spine is numbered (#2), just to drive the OCD movie collector's nuts, haha. I know this goofy cult-movie has it's fans, I remember my own father trying to throw it off on my at a young age, and while I admit he was absolutely right about how awesome Killer Klowns from Outer Space was and is, I just don't connect with Attack of the Killer Tomatoes in the same way, a zany non-sequitur slice of 70's cult that was just too damn stupid and poorly paced for me to really get into. However, if you are a fan of this movie this particular edition is jam-packed with cult-y tomato goodness, though I wish it had more new extras alongside the vintage stuff. I give it high marks for presentation but not a lot of love for the movie itself.